english version with dates further down. Auch dieses Jahr wird Reuters wieder in Davos sein und verschiedene Personen wie Linden Lab CEO Philip Rosedale, Linden Lab Chairman Mitch Kapor, Tim O’Reilly, Robert Scoble und viele andere live in Second Life interviewen. Wer Fragen stellen will, kann dies entweder vorher per Mail an adamreuters@gmail.com oder aber live vor Ort tun. Die Zeiten sind unten gelistet, mehr dazu auf dem Reuters Second Life-Blog. As last year Reuters is bringing Davos to Second Life again this year in form of interviews. I liked them very much last year and I look forward to this year. In fact it will start tomorrow. 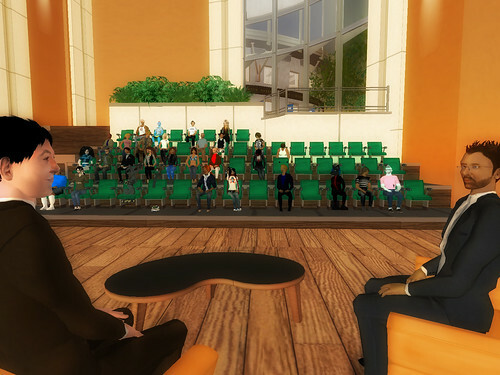 The good thing about these interviews is that you can ask questions in Second Life which will get passed to them. And that’s the reason why I like it, live participation! For more information about the schedule check out the post at Reuters (and their SL blog). Now this of course means that people from the US are unlikely to take part in this but last year at least they also have been recorded. You can nevertheless submit your questions in advance by emailing them to adamreuters@gmail.com. (the picture shows Adam Bronfman, CEO of Warner Brothers interviewed by Adam Reuters (Adam Pasick) at an interview in 2006 (not Davos)).